As a second leg of its tour to Tokyo, the Pakistani youth team had friendly baseball match and joint training with Tokyo Metropolitan Sogo Kohka High School’s baseball club on Sunday, September 29. The school’s principal, Norio Ishizaki, threw ceremonial first ball before the game. It was remarkable that Team Pakistan was quick to adjust themselves after the first game against Kosei Gakuen High School on the day before. Among the visiting players, Mohsin Jamil, catcher and Asad, pitcher, impressed Japanese coaches most and were assured to become good players if they train in proper way. After the activities on the baseball field, players and officials from Pakistan toured the school buildings and annual festival with full flavor of young Japanese. Being an engineering school, it is equipped with various technical facilities such as automobile testing plant and high-tech compounds including 3D printers which attracted interest of the guests. Metropolitan Sogo Kohka High has 600 students and aims to promote their international understanding as a part of education. 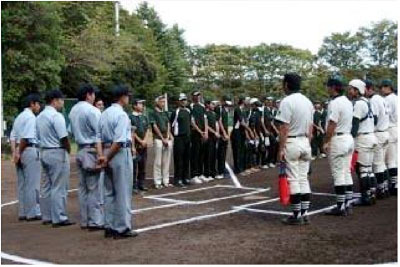 Its baseball club with about 100 members ranks among the top 8 of high school championship in Tokyo.